The 25th Quartermaster Press Anniversary Retrospective Exhibition will show at Vashon Center for the Arts, Koch Gallery, 19600 Vashon highway SW, Vashon WA April 6 - May 25. Opening April 6 at 5:30 p.m. with an introductory talk by Valerie Willson. 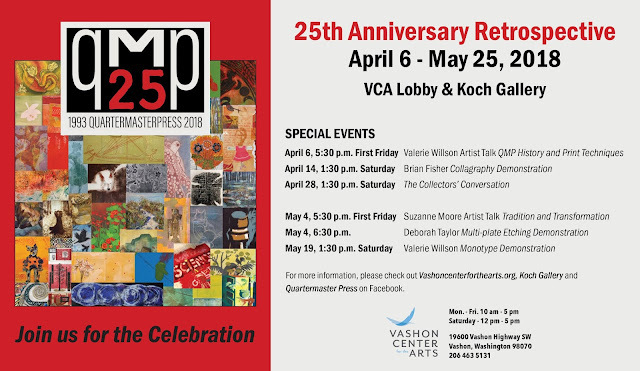 Featured- Print demos, QMP history, talks about Print Techniques, Print Tradition & Transformation, and a Collectors Conversation are all part of this special show highlighting print art created by 31 past and present Quartermaster Press print artists. Pat Churchill and I are co-curating this show. Deborah Taylor has created dynamic promotional invitations, posters and banners from the artists work featured in this exhibition.